If you’re looking for a meticulously sampled set of all your favourite old string machines from names such as Crumar and Solina your search probably won’t end here. Output’s design team came to the conclusion that there was already plenty to choose from if that’s what you need, so they set about designing something very different. 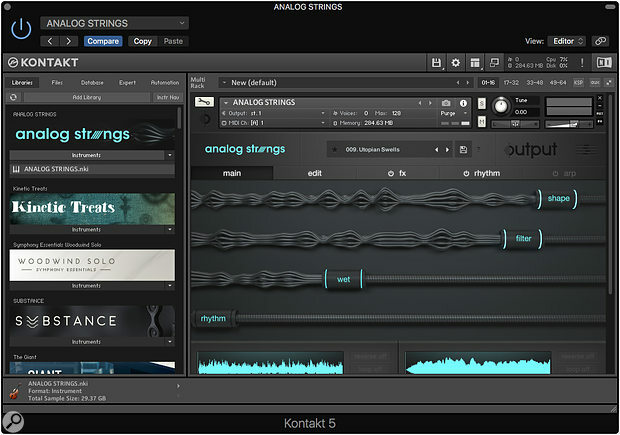 Analog Strings is a Kontakt instrument based on a dual-layer playback engine fed from sound sources that include orchestral strings, vintage synths and other sound design elements. It then uses a set of specially designed tools and step sequencers to bend them completely out of shape. While you can conjure up some very stylish basic analogue string-style pads, the real strength of this instrument lies in the way it creates new textures and soundscapes, many of them cinematic in nature. When installed the library takes up around 20GB of drive space, but the actual library is apparently rather larger as the files would take up almost double that if left uncompressed. To get you off to a good start there are 500 presets that ably show off the scope of sounds on offer. These can be searched by category and you can tag the ones you like by clicking on the star before the preset name. The core synth sounds came from a selection of vintage synths and vary from sustained notes to shorter ‘pluck’-style sounds. These sounds are augmented by less obviously ’string like’ recordings of feedback, tape noise, plucked piano strings and so on. The orchestral samples, recorded specially for Analog Strings, play a large part in making this instrument unique. In addition to the more obvious sustained notes, plucks, tremolo notes and hits, the recordings also include several orchestral effects such as scratching a violin with the wrong side of the bow. Other things that make this instrument so versatile include modulation, dual arpeggiators and a choice of three sound-source types (Synth, Orchestral and Creative) divided into One Shot, Pad and Tape Loop categories. Tape Loop provides a means to loop around selected parts of the source audio sample, and the loop length can be set in musical divisions and the start point adjusted by dragging in the waveform display. Most of these sound very obviously looped, but that’s the whole point. If you want something smooth you can choose from the Pad sound sources. Editing is possible at several different levels, starting with four Main Page Macro sliders that address the main parameters for each preset. There are additional tabs to access the Edit, FX, Rhythm and Arpeggiation elements of each patch, which have on/off buttons to allow you to bypass individual sections. The rhythmic and arpeggiator-controlled effects can, as expected, be sync’ed to song tempo. Separate effects, including delay, reverb, compression and distortion, are available for the two layers and there are also further overall global effects. When it comes to the layer effects, you can select from no fewer than 11 filter types where the usual controls for frequency, resonance, velocity sensitivity and envelope modulation can be found. You’ll also find a three-band parametric EQ, a multi-mode distortion, an adjustable compressor, delay with tempo sync plus the usual time and feedback controls, and a reverb with adjustment over pre-delay, size and wet/dry mix. As if that weren’t enough, the Global FX section provides a similar repertoire but with the addition of Chorus, Phasing and a Convolution-based reverb with a library of both real and abstract impulse responses. Output are the company that came up with the Movement plug-in, so it’s no surprise that a lot of rhythmic tricks are built in here too. Each of the two sound layers has its own rhythm generator that can be controlled from a step sequencer or a multi-shape LFO, whose rhythm can modulate volume, filter cut-off frequency, saturation, distortion drive and bit reduction. The rate can be adjusted by clicking on the fraction button where you can dial in the rate from a table or set it using the rate control. Sliders allow the modulation to be made either positive or negative. A Step Sequencer works in a similar way with a choice of preset patterns or the ability to adjust the sliders to create your own. In both the Rhythm and step sequencers, you can also draw in the position of the sliders as well as adjusting them individually. A smoothing control rounds out the step changes to create something more like an adjustable waveform LFO. You can also dial in a more traditional type of Arpeggiator effect with a choice of note hopping regimes, an adjustable number of steps and the ability to reverse or randomise the sequence. The number of octaves over which the arpeggio occurs is adjustable, as is the amount of swing. Flux is essentially a step sequencer that controls the modulation rate of all the rhythm generators (when enabled), in which each step has its own rate setting. It is also possible to force each Flux sequencer step to hold for a set amount of time (set as musical divisions) before moving to the next. The speed buttons may also be assigned to MIDI CCs for real-time control. While the presets come up with appropriate Macro controls for quick and dirty editing, when you create your own patches you can assign your own choice of parameters to the four Macro faders. When you’ve created a new patch and saved it, you can opt to recall it with or without the FX, rhythm and arpeggiator sections active. 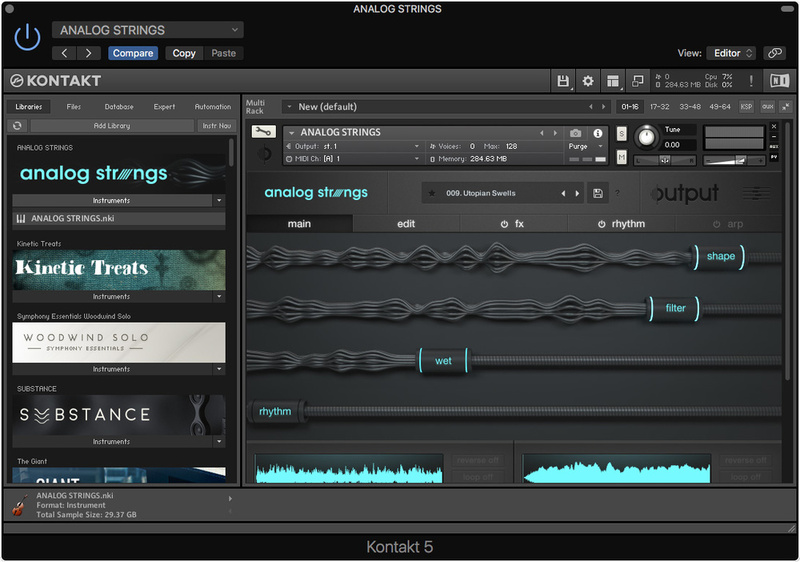 The name Analog Strings really doesn’t convey how deep this instrument can be, but you don’t have to tackle it all at once: just calling up one of the many presets and then swapping out sound sources can produce a wide range of variations. Once you get a little braver you can dig down further as there’s always something new to discover. The sounds range from rich string pads to orchestral stabs, pizzicato plucks and pulsing tremolo effects to the downright weird. Whether you are composing more conventional music or creating cinematic soundscapes, there’s a lot of fun to be had here.